Patrol boat P-22 - AFM picture. Eleven migrants were brought to Malta from a boat today, but other migrants opted to stay in the boat and continue their voyage North. 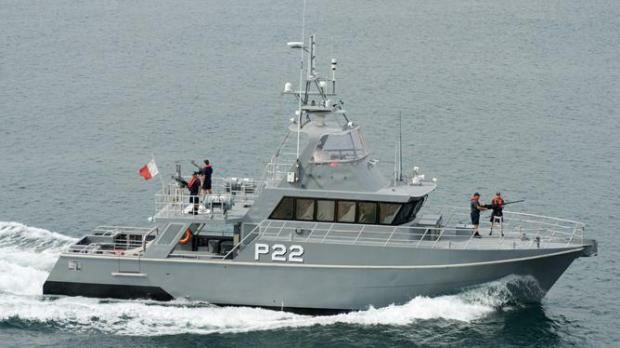 The migrant craft had been intercepted by the AFM's patrol boat P22 some 25NM South of Malta. A number of migrants onboard requested assistance while the rest refused assistance and asked to be allowed to continue their journey, the AFM said. "In an effort to calm down the situation, resolve the impasse and prevent the situation from degenerating into one which could endanger the lives of all those on the migrant craft, the P22 Inshore Patrol Vessel embarked the 11 persons who requested assistance. The remaining migrants, approximately 30 persons, continued with their journey northwards under AFM supervision."